www.XtraGist.com: Nurses, Social Workers & Health Specialist!! Nurses, Social Workers & Health Specialist!! Are you a health worker, social worker, nurse or interested in community development? 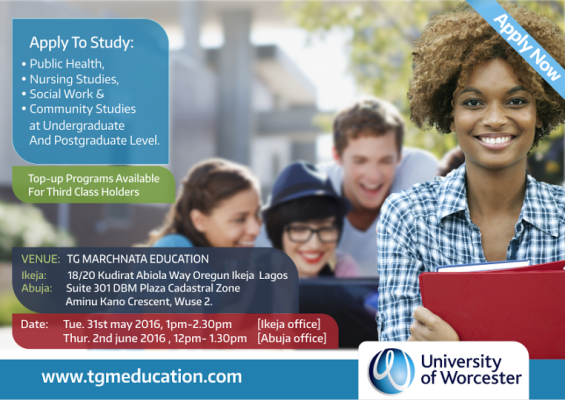 The opportunity to start your degree this September 2016 is still open. There are a number of diverse programs open in this field of study not only because it’s a professional course but also because it gives you the opportunity to affect the lives of millions of people positively and directly. A degree from this field of study has numerous employment opportunities, internships, work placements& career development workshops abroad for graduates to embark on with many influential companies in the UK. · WORK while studying towards your degree. TG Marchnata is giving you that opportunity to get that degree you have always dreamed of and not have to wait another year. Meet international representatives from University of Worcester in UK to discuss how you can make that timeless dream a reality. Register here : https://goo.gl/DVWiMu to book a place at any of these events. Venue: IKEJA OFFICE- 18/20 Kudirat Abiola Way, 3rd Floor Kobi’s Building, Oregun Ikeja, Lagos. • Fast track application offers. • 100% visa success rate. • Professional counsellors available to give guidance.